9. infertility. Cinnamon contains a natural chemical called cinnamaldehyde, which studies show increases the hormone progesterone and decreases testosterone production in women, helping to balance hormones. 10. Cinnamon holds promise for various neurodegenerative diseases, including: Alzheimer’s disease, Parkinson’s disease, multiple sclerosis, brain tumor, and meningitis, according to research at the Cytokine Research Laboratory, Department of Experimental Therapeutics, The University of Texas. Their research shows that cinnamon reduces chronic inflammation linked with these neurological disorders. 11. Not a health benefit, but a great reason to love cinnamon, it’s versatile. It works with sweet and savory dishes alike. Consider that many curries and savory Moroccan dishes include cinnamon. It’s not just for apples anymore. 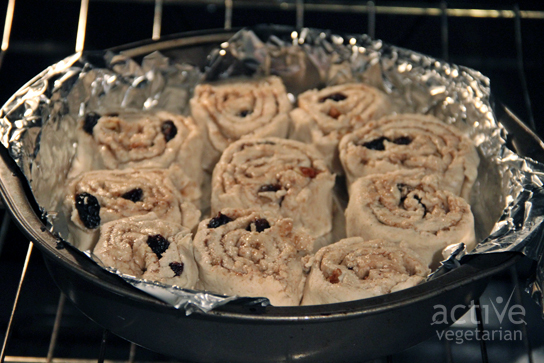 Line a baking dish with parchment paper or tinfoil and lightly grease with some coconut oil. First we need to make some “buttermilk” – vegan style…. Combine the following 2 ingredients and let sit for 5-10 mins. Before you start the dough…. place about 2 tbsp of coconut oil (or earth balance) in a oven safe dish and place it in the oven to melt. Combine all of the dry ingredients in a large mixing bowl. Now create a well in the centre of the flour ingredients and carefully pour your vegan “buttermilk” into the bowl. Mix together until well combined and a workable dough starts to form. 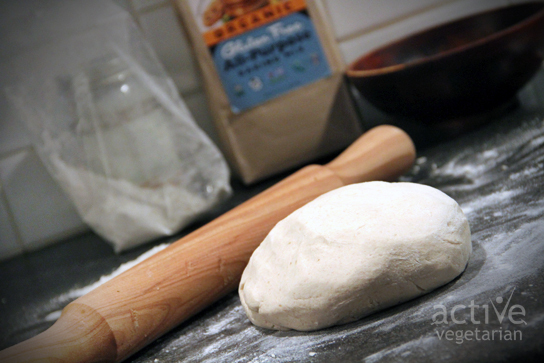 Now on a well floured surface knead the dough and roll into a rectangle. – with a rolling pin of course. Next spread the melted coconut oil (or earth balance) on the dough and sprinkle with the cinnamon sugar mixture. *you can add more sugar depending on how sweet you want them. 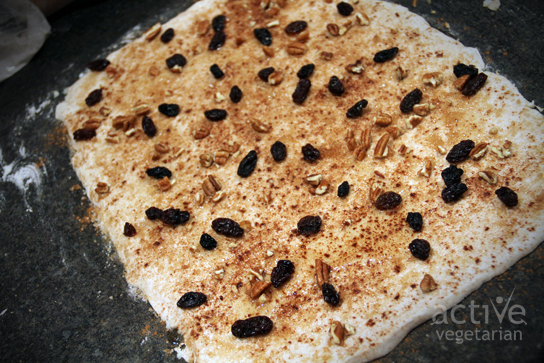 I also added some raisins and chopped pecans – be creative add what you like. Roll the dough making sure to roll tight and straight so the ends are even. Now with a “bread Knife” carefully cut them into the desired thickness – using a sawing like motion helps. Place them in the prepared baking dish and bake for 25 mins or golden brown. Once they are done remove them from the oven and drizzle with maple syrup. Cinnamon is everything you mentioned and more! As a fellow cinnamon lover I always use organic true cinnamon (cinnamon zeylanicum variety) to be sure I get these health benefits. Regular commercial cinnamon is cinnamon cassia which is not even the same plant, although part of the same family, it does have a few of the health benefits however it just doesn’t compare in taste, aroma and nutritional properties. Also for other followers I used the Bob’s Red Mill Gluten Free Flour (bean mix)and it was super uber sticky to deal with and probably wasn’t the best choice. Next time I would try a different brand. I blended honey, water, cashews, coconut butter and cinnamon for a sticky cinnamon bun topping! Thanks for your recipes, I look forward to more! Thanks for the interesting information on cinnamon and the great suggestions for all of our followers :). I am glad you enjoyed! I wish gluten flours worked out for me! Rolling was challenging and the result was like spackle, very dry. Perhaps because I kept adding flour to keep it from sticking to me, the board and then the parchment paper. I used trader joes gluten free flour, basically a rice flour mix. I will still eat them with a pot of tea cuz a least they won’t give me wheat bloat and there’s raisins, nuts and sugar in them! But I wouldn’t serve ’em…. I’ll look for king Arthur brand & try again. Thx for sharing. What flour do you recommend that is less sticky or how did you keep yours from sticking? 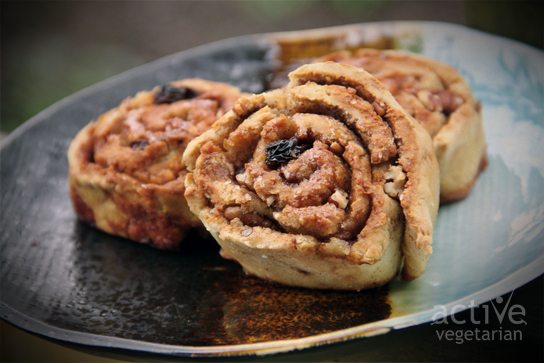 I want to make these this weekend and I have had similar issues with other recipies… Thanks for your help and for the great recipe! I can’t wait to try it! Hi Kristan, Thanks for checking out our site! hmmm I used a Gluten Free All purpose flour I found at winners/homesense, I do not recall the brand. I would be tempted to try it again using coconut flour, although I find once baked anything with coconut flour creates more of a crumbly – fall apart type of result. Some other alternatives could be brown rice flour, chickpea flour, or quinoa flour maybe? Or maybe some ground up gluten free oats? I hope these suggestions help. I must have just got luck with the brand of flour I found. Also experiment with the ratio of liquid to flour until you create a workable dough, it all depends on the flour. I know Amaranth flour tends to be stickier. She used wholesome chow all- purpose gluten free flour I can see it in the pictures.